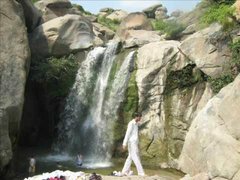 Located in Mardan, the Swabi waterfalls are one of the major attractions of this province. The Swabi waterfall is considered one of the highest waterfalls of Pakistan. The pearl colored water flowing from in between the rocks produces an interesting effect on the onlookers and the fresh breeze is dripping from the surrounding trees whips the hair immersing you in the place’s beauty. The province of Khyber Pakhtunkhwa is dotted with fresh water springs and crystal colored waterfalls making this place no less than a heaven on earth. There are many small streams and creeks hidden in between meadows and mountains, or flowing majestically from the tops of high mountain peaks which makes this place a preferred spot for an escape when the heat gets the best of you. If you want to witness a glimpse of heaven on Earth, then you should plan your next visit to this part of Pakistan.